Learn how to properly care for your rugs. Wash small rugs: If you have a smaller rug, be sure to check the label. Many small rugs are machine washable. If that is the case for your rug, shake it outside first to remove loose debris and then put it in the washing machine at the recommended temperature. Be sure not to use any hotter than warm water (90 to 105 degrees) and use a mild detergent. Tumble your rug dry at the lowest heat setting, and make sure it’s completely dry before you put it out again. 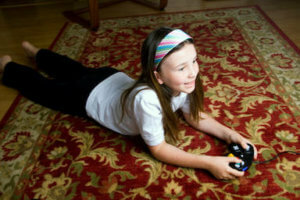 Beat larger rugs: Larger rugs that can’t be washed in a home machine should be shaken and beat outside. The best way to do so is to place the rug over a clothesline and start beating with a rug beater or even a broom. Once you’ve beaten the rug to the point where dust no longer flies out when you hit it, you’ll still need to take the rug inside and vacuum it to completely remove all dust. If the label says dry clean only, then roll it up and take it to a professional rug cleaner. Save time and frustration by calling first to see if the cleaner does rug cleaning, many do not. You can also trust your rugs of all types with North American Chem-Dry technicians who have been trained as an Area Rug Expert for off-site cleaning. Vacuum area rugs: Area rugs with fringe require special technique in order to not damage the delicate fringe. When vacuuming, apply gentle pressure and start from the center of the carpet, vacuuming toward the fringe while being very careful not to catch the strands in the beater bar. Carefully lift the carpet edge to vacuum beneath the fringe. Caring for Oriental, Turkish or Persian rugs: Clean imported rugs according to the carpet manufacturer’s specifications or bring in a professional cleaning service. For heirloom-type rugs, you need professionals. Call North American Chem-Dry in San Francisco today for rug cleaning experts you can trust!